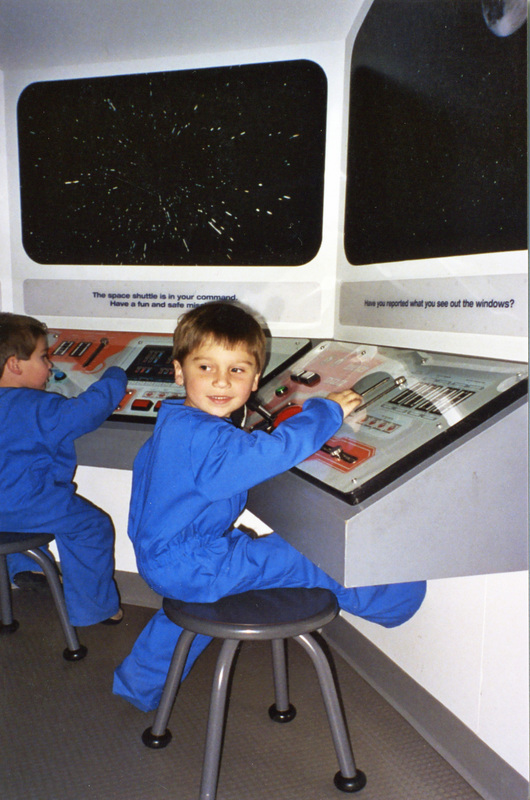 Joe and Luke playing astronaut at the museum six years ago at nearly 4 and 6. I have always loved the Denver Museum of Nature and Science, which was known in my childhood as Denver Museum of Natural History. I remember my school field trips there on creaky, uncomfortable yellow buses back when a trip from the suburbs to downtown felt like a trip to the moon. In college friends and I would trek down from Boulder for a welcome study break and a chance to picnic in City Park. 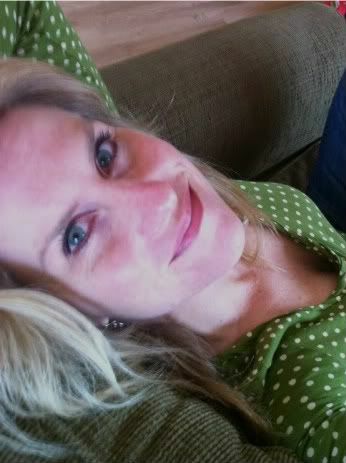 When we had our sons, I could not wait to share it with them. And I did. Most visits consisted of me hurriedly following them as they raced through the exhibits, unable to read and only patient enough to stand still for a moment. On those visits we spent more time commuting to and from the museum than we actually spent in the museum. Still, we’d always have to stop in the space exhibit so they could try on astronaut suits and attempt to dock the Space Shuttle. One time my super speedy, two-year-old Luke beat me up the ramp out of the Mars exhibit and was immediately lost in the crowd. I found him a few minutes later, two floors up, crouched in a weepy ball on the third floor staircase and surrounded by concerned parents who wondered where his negligent mother was. (He’s been more diligent about staying near me ever since.) Most visits ended in the gift shop where often, although not always, they were treated to a small souvenir. The boys are much bigger now but they still look pretty small next to that mammoth. Today we took the boys as promised back to the museum, our first trip there this year. Joe, ever enthralled by natural history, has been pestering us to take him to the Mammoths and Mastodons exhibit since it opened in February. I carefully plotted to take him closer to the end of the exhibit’s run so we wouldn’t have to share the exhibit with half the city. With a couple visits to this museum every year since the boys were 4 and 2, we now have the rigamarole down to our own science. Today we arrived a few minutes before opening at 9 so we could beat the crowds. We got into the exhibit itself at 9:15, which gave us a full hour to explore before heading down one floor to catch the IMAX movie called Titans of the Ice Age, featuring (you guessed it) more mammoths and mastodons. Afterward, Joe wanted to run through the dinosaur exhibit and the space exhibit before ducking into the gift shop. By that time we were starving but we acquiesced. When Steve and I paused to enjoy the museum’s fantastic view of City Park and the Denver skyline, the boys took off without giving notice. Because they’re older now, there was no panic at their disappearance as there would have been in years past. We simply walked back to the main corridor and looked around. After a minute we spied them on the first floor near the gift shop glancing around nervously. When they saw us approaching, they looked momentarily relieved and then bolted for the gift shop. Some things never change. On the way home (without gift shop souvenirs and the subsequent tantrums that used to follow that sad situation) the four of us excitedly discussed what we’d learned. We each had favorite revelations and discoveries. I was interested to learn that elephants are not descendants of either mammoths or mastodons as I had imagined. All three proboscideans are descendants of one common ancestor, which makes them more like cousins. Mammoths lived in colder climes and ate grasses, while mastodons lived in slightly less icy environs and munched on trees and shrubs. The more we listened to our sons talking about their visit, the better we felt about our decision to set our alarm for 7 a.m. on a Saturday morning. More than once Joe interrupted his non-stop recounting of myriad factoids about late Pleistocene mammals to thank us for taking him to the museum. 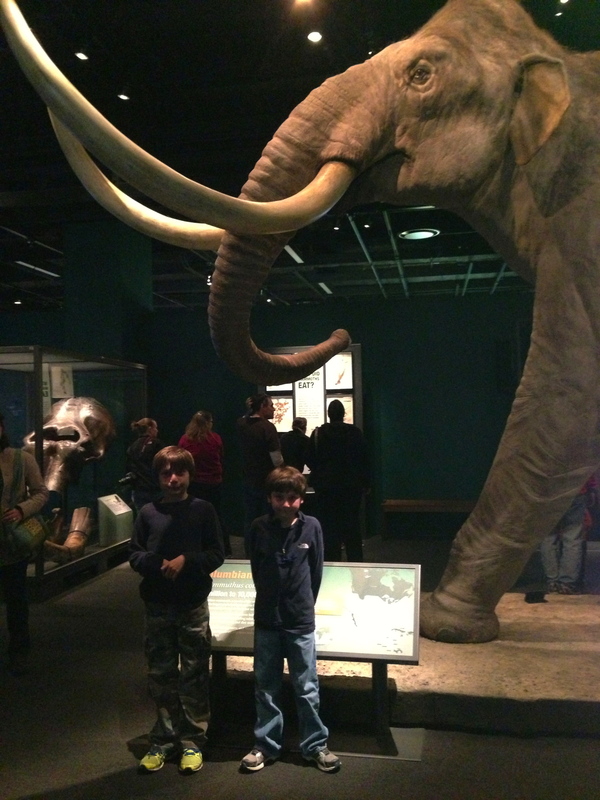 Tickets to mammoth exhibit for a family of four: $26. IMAX 3D tickets for more mammoth fun: $20. Gratitude from my preteen son for an educational experience…priceless. My kids were never quiet or still enough for story time at the library. (We were kicked out more than once.) They’ve never been great at sitting still at the dinner table or a table in a restaurant. Despite the plethora of professional sporting events we’ve taken them to, they’ve only ever one time made it through an entire game. These things used to bother me. They don’t anymore. So what if they’re not quiet readers or princes of table manners or sports fanatics? They are curious learners who get all geeked out over dinosaurs, early mammals, space, rocks, animals, health, and history and who would rather conduct intellectually fueled Google searches and build elaborate virtual worlds than play soccer or baseball or lacrosse or football. Yep. They’re nerdy just like their parents. As the old saying goes, the apple doesn’t fall far from the tree. Turns out that’s exactly how I wanted my apples to land after all. I thoroughly enjoyed reading of your family’s recent museum experience. Needless to say, on our way out, we too, visited the Space Exhibit. Two folks in their 70s marveled at how museum experiences have ‘evolved’ since the 70s when our daughters were delighted to go the ‘dinosaur museum’. Congrats on growing ‘dem apples!